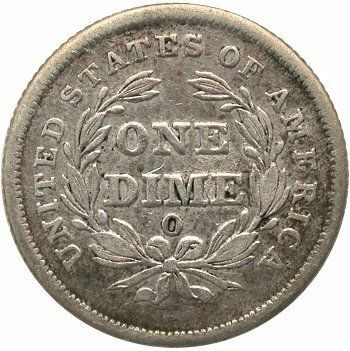 Comments: This variety is easily attributed by a combination of a weak obverse die and a Huge O mintmark on the reverse. 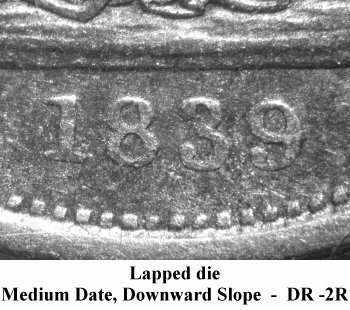 Reverse G is the left over Huge O reverse die from 1838 and is rusted with significant die erosion or die rust marks between ON(E) and DI(ME). Obverse 5 is initially paired with Small O Reverse B and that die pairing is designated as Variety 107. Examples from the Variety 107 die pairing can be found with reasonably strong Obverse 5 details. 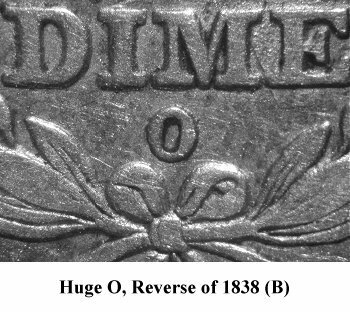 However, it appears that Obverse 5 is lapped between the Small O and Huge O reverse die pairings. When paired with the Huge O reverse, Obverse 5 exhibits a weak date in combination with weak Stars 1 through 3. 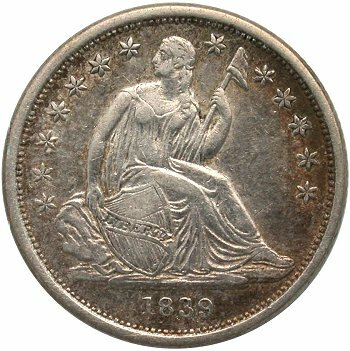 This is a scarce variety that is occasionally seen despite high historical premiums in Coin World's pricing guide. Since 2010, the author has noticed an elevated number of specimens entering the market with most grading between VG through VF. Original and problem free examples grading full EF or better remain rare.